After leading his high school team to a state championship last season, the incoming freshman is finally fulfilling his dream of wearing the blue and gold in Pauley Pavilion. No, we're not talking about Kevin Love. A matter of fact Love didn't even win his state championship last season - but Chace Stanback the "other" Bruin freshman did. Stanback averaged 25.8 point and 11.9 rebounds in leading his Fairfax Lions to a 28-5 record and a victory over Oakland McClymonds in the California Division I championship game. He garnered individual honors winning the state Division I Player of the year. While his fellow freshman, Kevin Love, is a gregarious kid who has a natural gift for dealing with media and the public, Stanback is more reserved and soft spoken yet possesses a quiet steely confidence about himself. In his four seasons at Fairfax Stanback steadily improved his game each and every year which impressed Bruin Head Coach Ben Howland enough to recruit him and offer a scholarship. 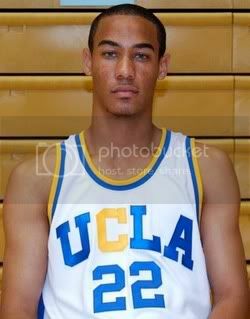 Stanback gave UCLA an early verbal commitment in his junior year. "Chace has a great attitude and work ethic, and works hard to improve his game." Howland said. It's his work ethic the Bruins are counting on this season from Stanback as he learns the system and develops his game. The 6'8 210lb freshman is already familiar with most of his new teammates since he grew up in the local area and played in summer pick-up games against them. At Fairfax he played a single year with Josh Shipp. "I played with Josh when I was a freshman and he was a senior," Stanback said. "I looked up to him and learned a lot that year and then watched him play great at UCLA". Stanback understands he's the new kid on a team flush deep with returning veterans at the wing position, but he's ready to contribute when called upon. "I want to give the team anything they need," Stanback said. "If they need a score, I'll try to score, if they need me to shut someone down - I can do that as well." BBR Notes: The Bruins will hold their first practice tonight from 10:00PM to 12:30AM; however, the practice is closed to the public and media. UCLA basketball staff will be holding its annual coaching clinic on November 3rd from 8:30AM to 3:30PM. The cost is $50.00 per coach or $170.00 per staff (no more than 4) $60.00 for walkups. BBR, do you have anyone have any inside info on who the starting (5) and what the rotation will be. That gold "C" looks ridiculous. I know it stands for 100 NCAA titles, but couldn't they just put a simple "100" on the corner of their shorts? Are they selling items with that gold "C" in the student store? I will not buy one. I will look for items that have the regular UCLA lettering. The team is practicing together for the first time tonight, and its doubtful Howland has settled on a line-up for the start of the season. However, Howland has already stated his returning starters from last season (Luc, Lorenzo, Darren, and Josh) are the starters at this point with the 5th spot open, but this may change after the team begins to practice together. KS Wong, good reports! Keep up the good work. I have to agree, the gold C looks silly. Our home jerseys were so classy the way they were before. It's too bad.